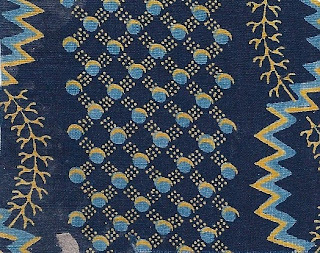 For centuries, blue textiles were the 'color of kings'. The Indigo plant (Indigofera tinctoria for India/Africa and anil for the Americas) is native to a tropical/sub tropical band around the globe. Mayans mixed indigo with clay for the famous Mayan blue, African chiefs wore garments dyed blue along with the ruling classes in India and Japan. The production of natural indigo dye first yields a liquid and with draining a paste. This works well for local/regional dyeing. If this paste is patiently dried into 'junks', than the dye can easily be transported great distances. As European powers colonized parts of South America, Africa and Asia, they had easy access to the dried indigo. ( Europe had used woad to dye woolen textile blue. Processed woad has .5% dyestuffs while high quality Indigo is 80%) East Indiamen loaded with Indigo chests arrived in Europe. Blue became the new fashion color of the 17th century. Synthetic Indigo was first produced by von Baeyer in 1897. He won the Nobel prize for his discovery in 1905. Not only did the price drop for the dyestuffs but the supply became more reliable. Now it was blue collar workers and blue jeans. 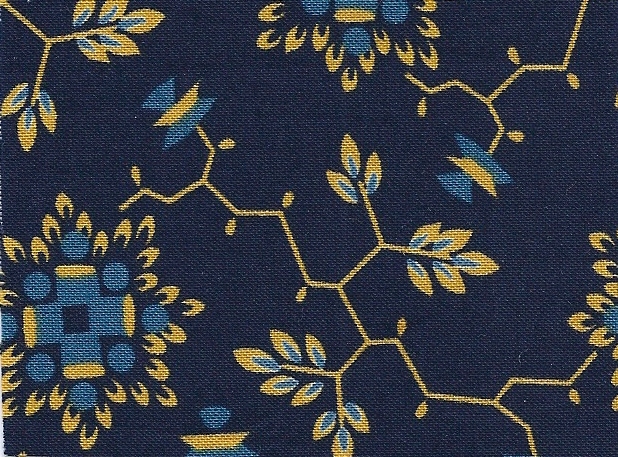 Resist printed Indigo designs feature a white motif on a deep blue background. If you remove the resist and redye the fabric you have a 'two blue'...powder blue design on the deep blue background. With the advent of the chrome dyes in the 1810s, yellow and orange were more reliable textile dyes. When goods were printed with the discharge method--the entire length of fabric dyed blue and the printed with a discharge paste--and if a chrome yellow was added to the discharge paste, you have an illumination, a bright yellow design on a deep blue background. These are both examples of illuminated two blues from my Dargate book, c. 1830 Mulhouse France. I reproduced these in a line called Dargate Indigos. Love that range of Dargate indigo's you bought out. I have just used one in a small doll quilt that Lori at Humble quilts has been doing.